The Metro Nashville Police Department has reportedly filed a report on Saturday’s weak bar fight involving failed NFL coaches and boisterous twin brothers Rob and Rex Ryan, after a man accused the pair of simple assault, reports TMZ. 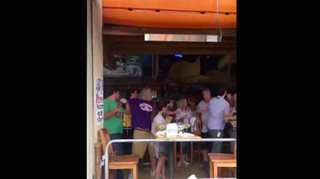 TMZ said a police spokesman confirmed that Matthew Havel of Colorado filed a simple assault report against the Ryan brothers over the scuffle at the Nashville Margaritaville, in which Rob Ryan was held back by his son and appeared to grab a man’s throat in a brief video of the fight. While at the bar, both brothers were chummy with the patrons and Rex Ryan, who was also shown on the video getting involved in the tussle, reportedly flirted with women at a bachelorette party by complimenting their feet. We left a message with the Nashville police and will update if we hear back. Matthew J. Havel, 30, of Pueblo, CO, made a complaint of a misdemeanor assault Sunday night. He alleges that he saw the Ryans in Margaritaville on Broadway, went up to their table, and that after being there for more than an hour, Rex Ryan reached across and grabbed at his neck. Havel alleges it was unprovoked. There are reports in the media from other persons who allege that a drink was thrown at Ryan. This matter is under investigation by the MNPD’s Central Precinct. No arrests have been made and no charges are presently outstanding.